The campfire is a highlight of most camping trips. "Everybody needs beauty as well as bread, places to play in and pray in, where nature may heal and give strength to body and soul alike," John Muir wrote in his book, "The Yosemite," published in 1912. A century later, when most Americans live in cities and suburbs and lead lightning-fast lives, the need for nature's restorative properties is even greater. More than 14 percent of the U.S. population went camping in 2013, according to the Outdoor Foundation and Coleman's "2014 American Camper Report." Nature soothes the spirit, restores attention and reduces stress. Camping in nature has been shown to help reset a person's circadian clock and also help veterans with PTSD reduce symptoms, according to HealthlineNews. Nature may also help with the physical healing process, according to the medical journal "Frontiers in Psychology." Strolling through a city park or gazing through a window at a garden helps, but camping is even better. As Henry David Thoreau wrote, "One can never have enough nature." The attention restoration theory explains that the feeling of "getting away from it all" when camping increases the restoration of attention and reduced anxiety and depression that being outdoors in nature can bring. Living in nature leaves more time for reflection and socializing. Many camping chores encourage teamwork, from pitching tents to building fires. Instead of grabbing a muffin and coffee at the office, set an aluminum coffee pot on the camp stove or fire and do nothing but listen to the birds while waiting for it to percolate. Fix breakfast together. Read under a tree for a spell. After outdoor fun -- hiking, swimming or whatever activities influenced your campsite choice, start the fire and cook dinner together. Gather at the picnic table and play games in the lantern's light or sit around the fire, sharing stories of the day's events and making s'mores. These are typical activities campers enjoy. Whether you're camping in a backcountry meadow or desert canyon, at a designated campsite on the banks of a river or the shore of a beach -- or glamping in a furnished safari tent above a lake -- camping locations accommodate a variety of interests, needs and comfort levels. Many national, state and regional parks, as well as private campgrounds, provide wheelchair accessibility. Amenities vary from none to drinking water, restrooms, showers, fire pits or barbecues, as well as ranger-led adventures such as snowshoeing under a full moon, hiking and wildlife viewing. Popular campgrounds may book up months in advance. Many have websites with campsite maps and online reservations. Most campers are more spontaneous, planning their trips about a month in advance, and often taking off on their adventure before reserving a site, according to the "2014 American Camper Report." The report found that 85 percent of U.S. residents who camp had experienced camping as a kid, before the age of 15. The survey included tent-camping, RVing, and renting yurts and cabins, but the report concluded tents were the preferred choice of the 40 million-plus Americans who camped in 2013. American campers prefer state parks, and typically camp more than 180 miles from home; 15 days scattered over five camping trips is the norm, according to the report. The top two camping activities: hiking and sitting 'round the campfire. 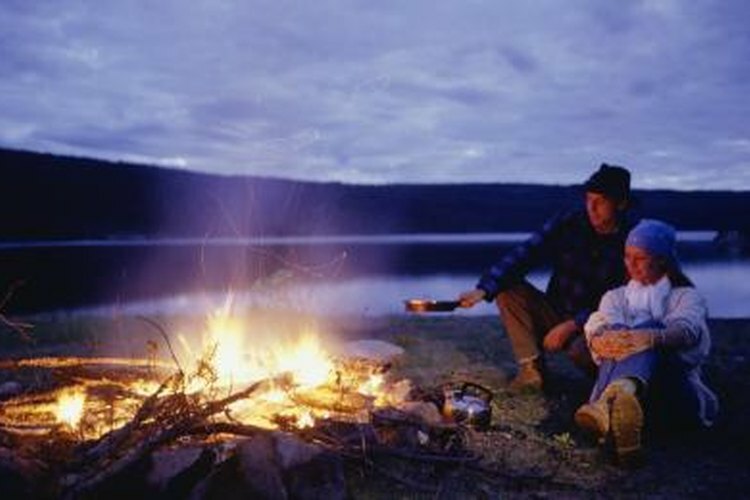 The words people mostly associate with camping include outdoors, tent, campfire, fun, wilderness, escape. Adventure, peace, friends, s'mores and happiness shortly followed in the top portion of the list, according to the same report. Whether escaping to a lake where the call of the loon, the crackling of the fire and laughter of fellow campers dominate the soundtrack or to a beach where the rhythm of the surf lulls you to sleep, camping is an extraordinary experience.